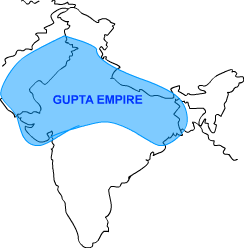 The Gupta Empire ruled over a major part of the Indian subcontinent from 320 to 550 AD. Maharaja Shri Gupta was the founder of the Gupta Empire. The reign of the Gupta Empire was a period of overall prosperity. This period also witnessed developments in the fields of science & technology, art and literature. Due to this, the Gupta Period is also known as the Golden Age in the history of India. Chandragupta I, Samduragupta and Chandragupta II were the greatest emperors of the Gupta Empire. The rule of the Gupta Empire was spread from the north-west to Bengal in the east. The Gupta Empire was restricted to the north of the Deccan Plateau. But during its peak, it also extended to some parts of the eastern coast of India. Samudragupta: Samudragupta is considered to be the greatest king of the Gupta Empire. Some historians also equate him with Ashoka the Great. Historians have come to know about him through the coins and inscriptions. One inscription on an Ashokan pillar in Allahabad gives a detailed account about Samudragupta. It was a prashasti; written in the form of a long poem by Harisena. Harisena was a court poet of Samudragupta; around 1700 years ago. Prashasti is a Sanskrit word which means in praise of someone. Prashasti was written in praise of kings during that period. Samudragupta was a great warrior. He fought many battles to expand his kingdom. He was an able administrator and a good ruler. He was a musician, an artist and an author. Samudragupta encouraged artists, musicians and poets in his royal court. Kalidasa was famous poet in the court of Samudragupta. Aryabhata; the famous astronomer; also lived in the court of Samudragupta. A large part of north India was under the direct rule of Samudragupta. This part was called Aryavarta. In this part of north India; Samudragupta had defeated nine rulers and made their territories a part of the Gupta Empire. There were five rulers in the Dakshinapatha. They had surrendered to Samudragupta. Later on, Samudragupta allowed them to rule over their respective kingdoms. Assam, coastal Bengal, Nepal and many gana sanghas in the north east followed Samudragupta’s orders. The rulers of these states attended his court and brought tributes. The rulers of the outer areas submitted to Samudragupta. They offered their daughters in marriage. The Shakas, Kushanas and the rulers of Sri Lanka probably came in these areas. Thus, almost the whole subcontinent was under the rule of Samudragupta. Some parts were under his direct rule and others were ruled indirectly. Grand Titles of Kings: This period shows a new trend. The kings began to assume grand titles. For example; Samudragupta was called Maharajadhiraja.